Boar brushes have been around for a long time, for good reason. Because boar hair is very similar to human hair, there are a lot of unexpected benefits to using a boar’s head brush. To get them, be sure to always use the brush when your hair is dry. Brushing three times a day is ideal. There’s even a special technique to use to get the best results: flip your hair upside down and start brushing from the nape of the neck to the crown. This helps spread the beneficial oils throughout your hair. What are the benefits? 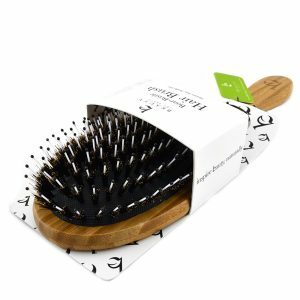 Boar bristle brushes stimulate the scalp, increasing blood flow and unclogging hair follicles. This helps hair grow longer and stay stronger. It also conditions by spreading your scalp’s natural oils throughout your hair. This gives your hair a natural shine that you just can’t get anywhere else. Plus, it tames flyaways and frizz and helps prevent split ends and breakage. Because it spreads the oils that otherwise accumulate at the root of your hair, boar bristle brushes can also make your hair look cleaner and eliminate the need to dry shampoo. Overtime, your hair will actually look and feel softer without the use of any conditioners, shine sprays, or styling tools. Taking proper care of your boar bristle brush is important, too. A lot of oils and dirt gets built up in the bristles and can make the brush less effective. 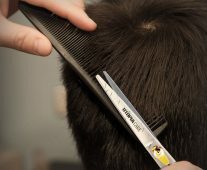 Remove any trapped hair by using a comb so you don’t pull out any bristles. Rinse them with shampoo or just water then use a cloth to wipe them off. Don’t soak them in water because it can damage them or even lead to mold growth. Squeeze out any excess water them place the brush on a towel, bristle side down, to dry. Do this once a week so your brush can keep working its magic on your hair. Now that you know why you have to have a boar bristle brush, let’s take a look at the best one’s out there. You might be surprised to see how versatile they really are! Dovahlia is a family business based in Austin, Texas that believe in incorporating natural and authentic beauty and personal care products into everyday life. Because they source the boar bristles from shearing rather than plucking, they treat the animals ethically. 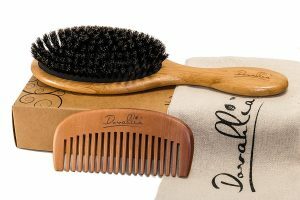 It’s hard to find a brush that works well with all types of hair, but the Dovahlia boar bristle brush does. Though it’s designed to thin, fine, or normal hair, it can easily be used on thick hair by simply brushing in smaller sections. Boar bristle brushes work best when dry hair is detangled first. Dovahlia knows this which is why they included a wide-tooth comb in this set. Use the comb on wet or dry hair. Make sure it’s dry before you flip your hair over to start brushing. Use this one twice daily for best results. This brush comes with a 365 day guarantee so, if you don’t like it, the manufacturer will give you a refund. Dovahlia brushes get consistently good reviews from their customers. What do you have to lose? This is a bit of a different spin on a boar bristle brush because in addition to boar bristles, it also has plastic pins to help detangle your hair and stimulate your scalp a little more. Because of the plastic bristles, you can use this on wet hair but keep in mind that the boar bristles won’t do their jobs unless your hair is dry. Another cool feature of this brush is that the handle is made of bamboo. Bamboo grows really fast and is a much more sustainable material than other types of wood. This brush is recommended for people with normal to thick hair because the plastic pins might be a bit too much for finer hair. If your hair is really thick or curly, you might want to consider adding an additional detangling brush to use when your hair is wet. Remember, boar bristles on their own won’t detangle and may actually make things a little worse! Detangling is the first step to letting the boar bristles work their magic to give you beautiful hair. This boar bristle brush works on a lot of levels. It’s a styling brush with nylon and boar bristles poking through a ceramic core. The idea is this. When you use your blow dryer with this brush, the ceramic barrel heats up. This helps you style your hair with volume or curl. The vented 2 inch barrel lets air travel through which helps with drying time. As it dries, the nylon bristles work to detangle while the boar bristles spread around the natural oils. These three things – the ceramic barrel, nylon bristles, and boar bristles – help make your hair shiny, voluminous, and smooth from root to tip. Some other things about this brush that make it a great investment? It’s lightweight and ergonomically designed plus it comes with a 12 months guarantee. That’s right – if you have any problems with your brush, you can get a replacement or a full refund within 12 months of purchase. If you have thin or fine hair, this is the boar bristle brush for you. The bristles are shorter. What does that mean? They’re not a good fit for people with thick hair. Remember, a boar bristle brush works by spreading the oils that collect on the surface of the scalp. 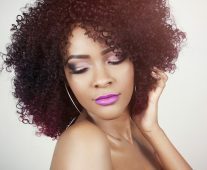 Short bristles are great for fine hair but won’t be able to get through thick or curly hair to be effective. This is a pretty standard hairbrush. 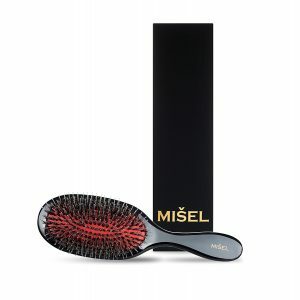 Oval shaped with a cushion, the bristles really work to spread the oils from root to tip. It’s pure boar bristle – no nylon bristles here. Remember, even people with fine hair need to make sure they detangle their hair before they use a boar bristle brush for it to be effective. 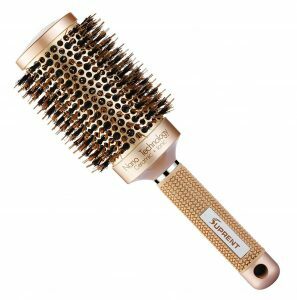 This is another hybrid of boar bristles and nylon tipped bristles that combines detangling and the conditioning effects of boar bristle in one brush. The boar bristles are of the highest quality and effectively spread oils while the nylon bristles massage the scalp and work through difficult knots and tangles. One thing to point out about this brush the nylon bristles don’t have plastic ball ends that can crack get stuck in your hair. These were designed in Los Angeles and made to adhere to high European quality standards. In fact, they’re so gentle on your hair, you can even use them to brush hair extensions. For best results, make sure to pair your boar bristle brush with a great hair dryer and great hair drying technique.